There are certainly three Kestrels flying around Buck Hill. 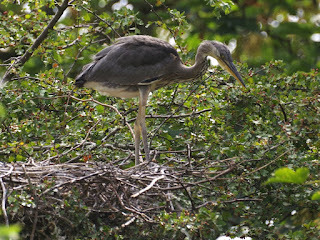 The third one, probably male, kept his distance, but the others afforded good views. One was mildly harassed by a Carrion Crow, which however kept a respectful distance from the smaller bird's powerful talons. 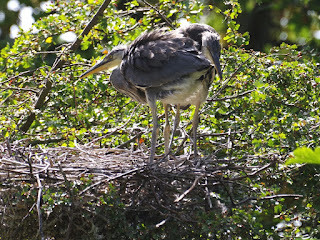 This morning there were two young Grey Herons in the nest on the island as usual. But this afternoon one of them had gone. 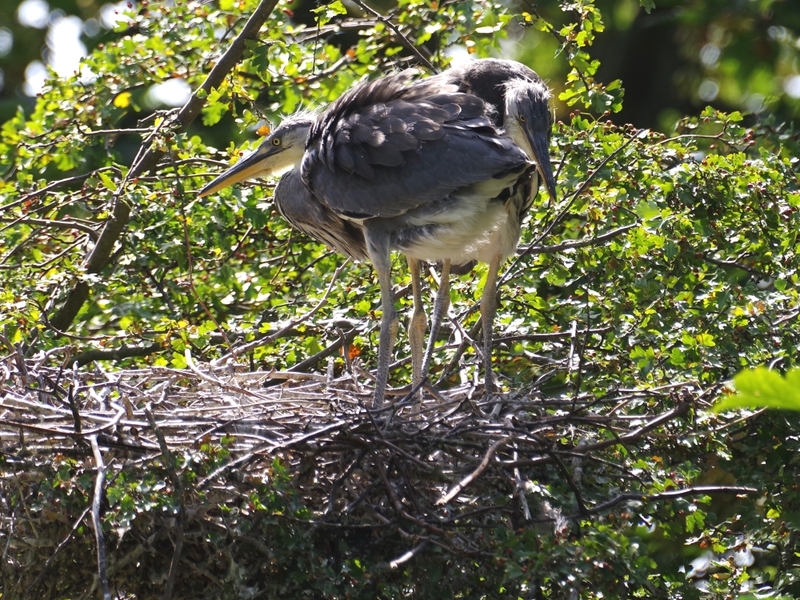 I don't think it was just lying down in the nest. 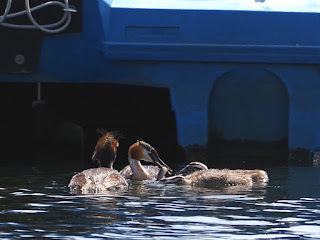 I looked around on the island, as far as it can be seen from the shore with binoculars. 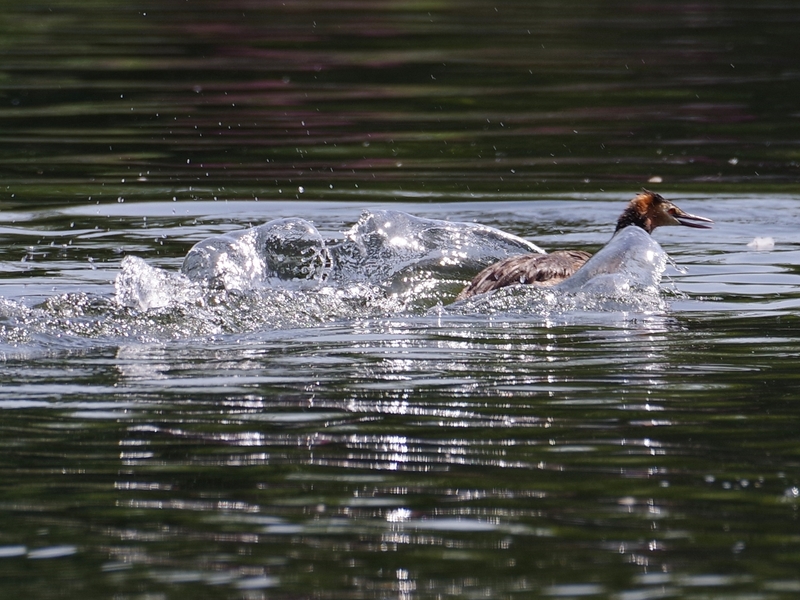 There was an adult, but no sign of the young one. 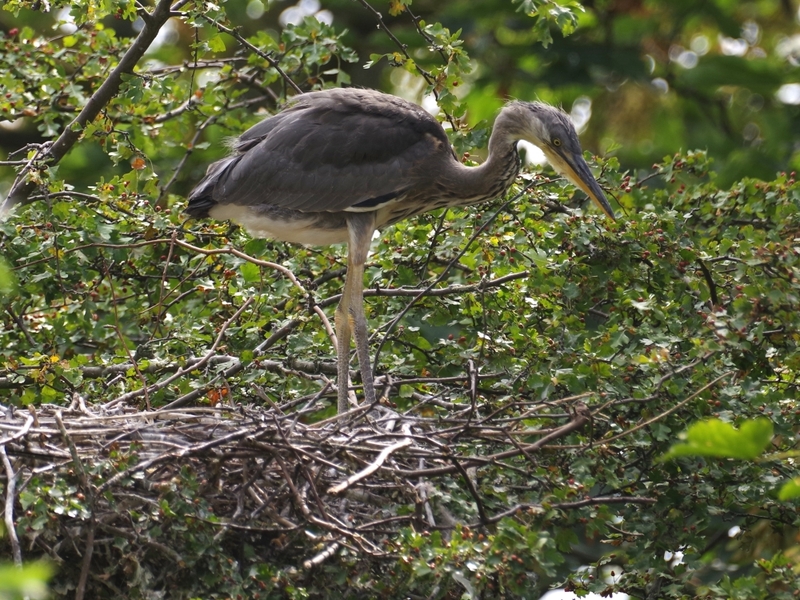 I hope it has left the nest in an orderly fashion when it was ready to go. 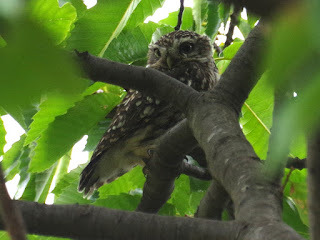 Their wings are certainly well enough developed for at least a safe flutter to the ground. Tom photographed and filmed a Lesser Black-Backed Gull eating a Feral Pigeon which it had caught in the Italian Garden. The Great Crested Grebes at the island with three chicks were feeding them, but there wasn't much enthusiasm for this fish. The third chick, out of the picture, didn't even bother to come over. They must be very well fed. 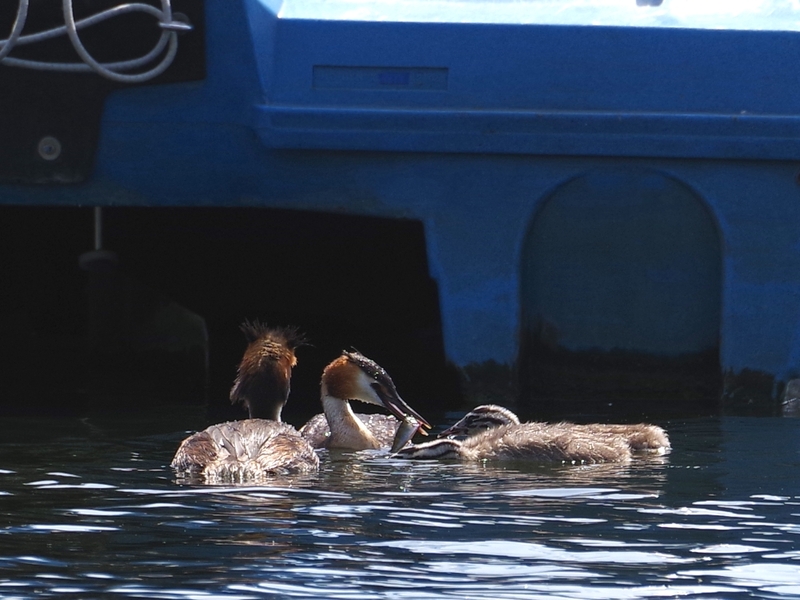 When their father caught his next fish he didn't bother to take it to the chicks, and ate it at once. 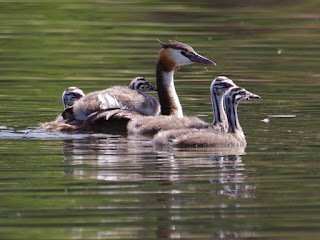 On the Long Water, one of the four chicks climbed on to its father's back. There's only just room for it now. 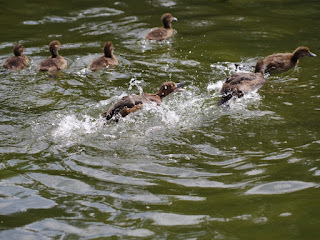 Their mother rushed at a rival to chase it away. 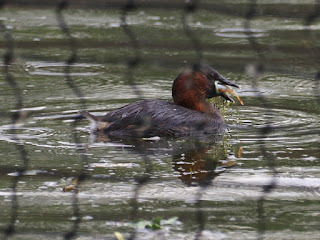 One of the Little Grebes, not seen for a while, could be seen through the netting surrounding the reed bed near the bridge. It caught a fish, which came up tangled in fine plastic netting and had to be shaken to remove it. This netting is turning up everywhere. 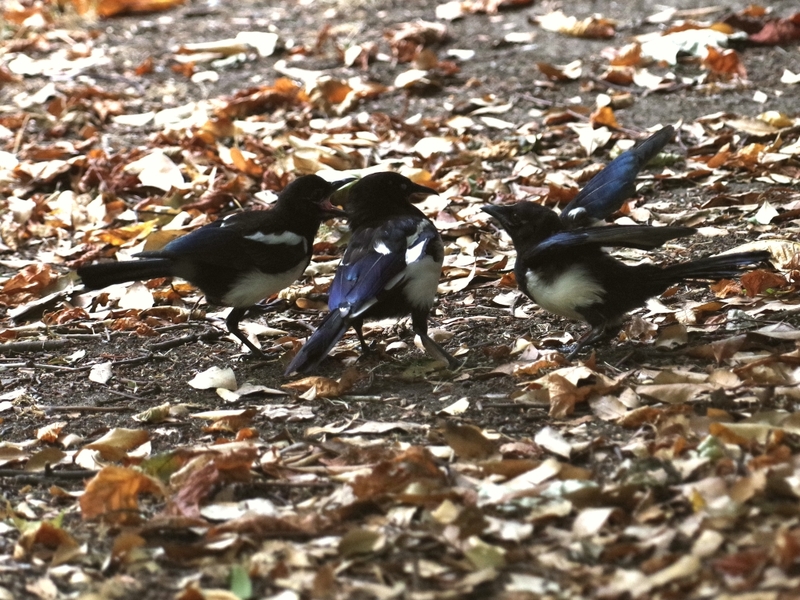 It doesn't rot, and is a serious hazard to wildlife. One of the Coots at the Serpentine outflow went down the plank to the lower level of the weir to feed its chick, which could be heard calling. 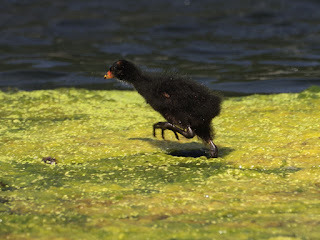 The Moorhen chicks in the Italian Garden are growing, but they're still small enough to be able to run over the mat of algae without sinking in. There were two families of Tufted Ducks together at the island. 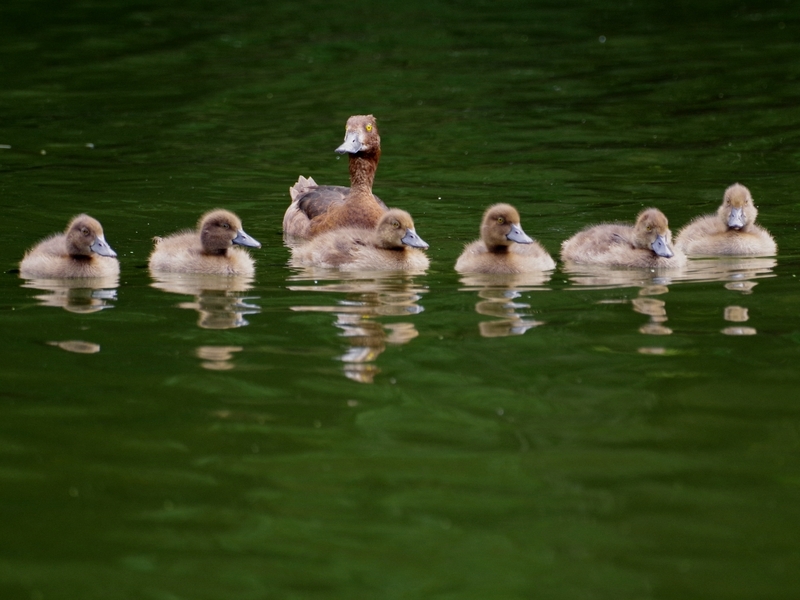 Here's one with six ducklings. 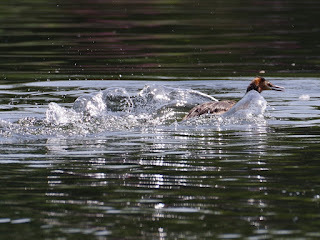 The other one, with seven, came too close and there was a brief flurry as the family was chased away. 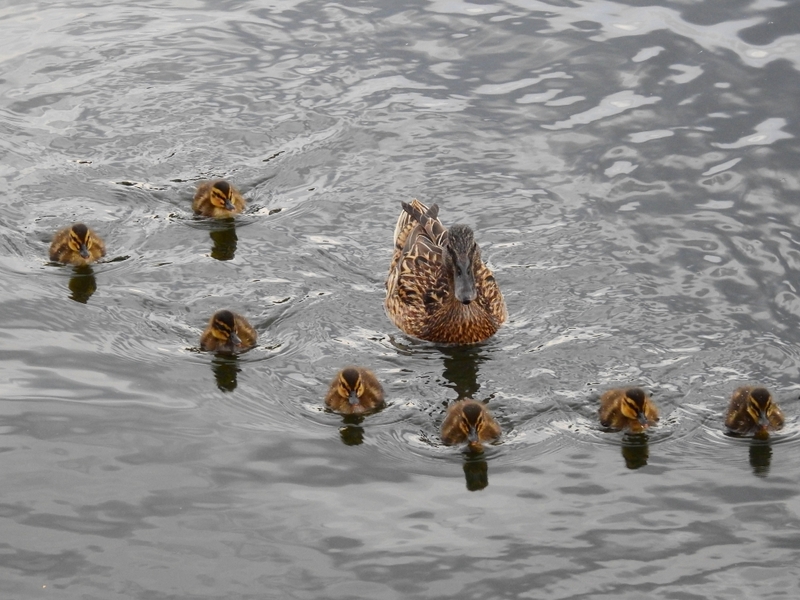 A new Mallard family with seven ducklings turned up at the Diana fountain landing stage. The Little Owl at the leaf yard stared indignantly at a Magpie in his tree. 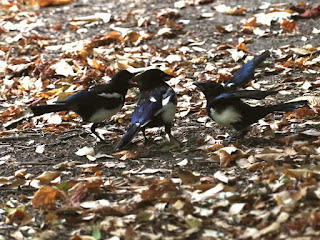 On the ground underneath, two young Magpies were pestering a parent for food. 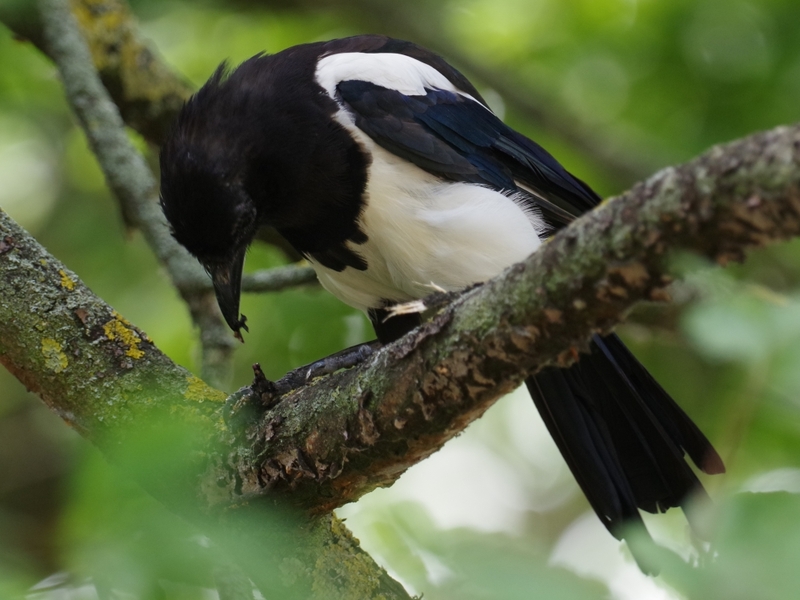 Another Magpie had caught a large insect. 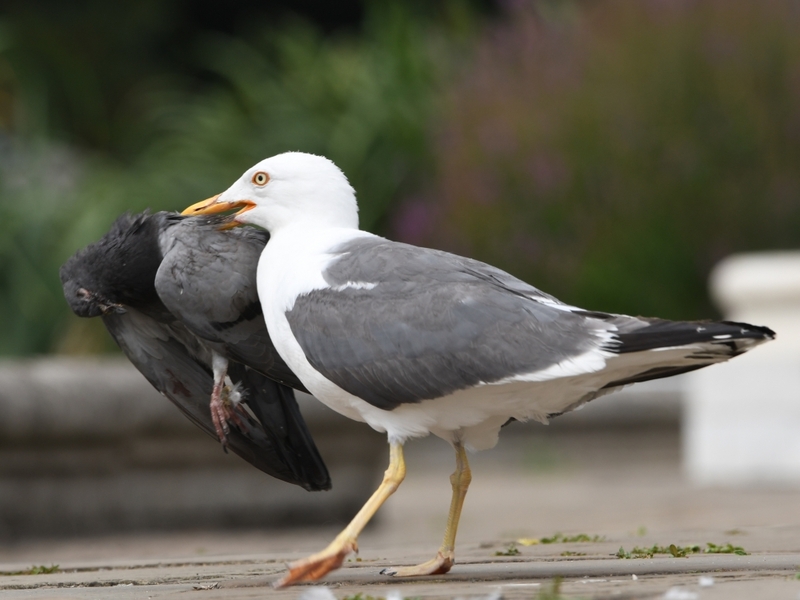 It held it down with one foot to peck pieces out of it. Warning: nothing happens in this boring but mercifully short video. It's just to show the remarkable density of water fleas (Daphnia) in the fountain pools in the Italian Garden. I beg to disagree. 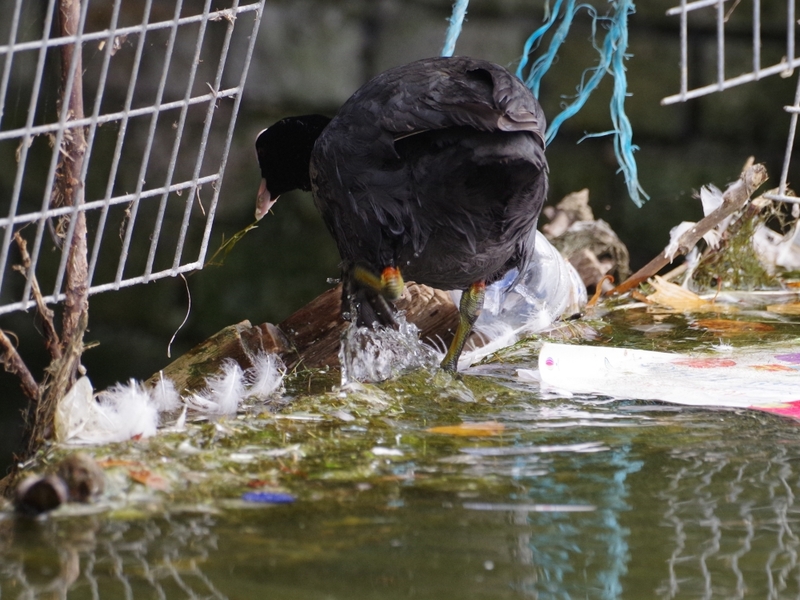 I enjoy listening to the sound of water rushing in the water fleas clip. It makes me feel psychologically cooler. There is always something of the utmost interest in your videos, be that sound, image, or, as is usually the case, all together. 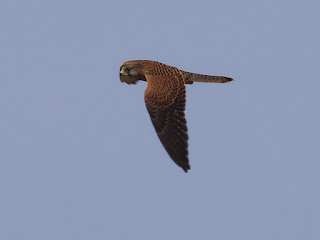 Kestrels here routinely harass and bully Booted Eagles. They are very ferocious for their size. 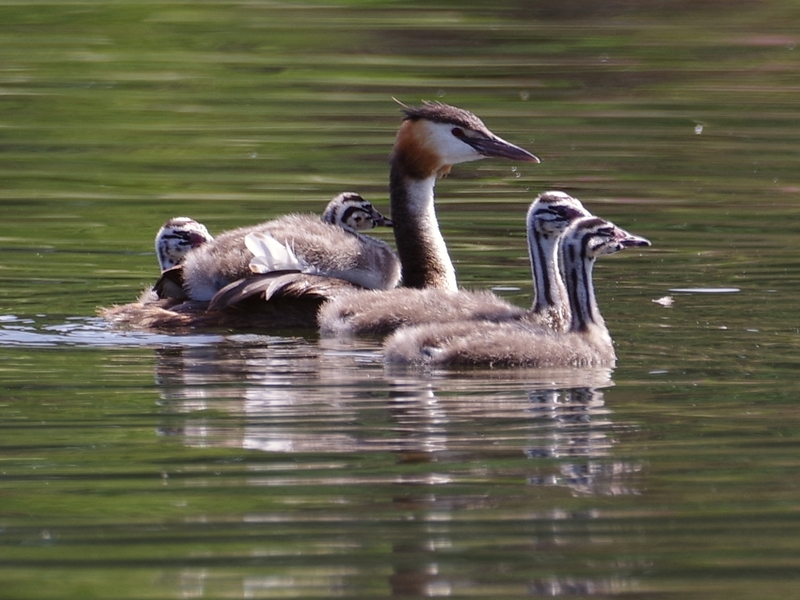 Love seeing all the wonderful pictures of the Grebe families doing so well! Perhaps I ought to have made a three-hour version, like the many long YouTube clips of thunderstorms and rain that people use to help them get to sleep. I certainly would welcome it. 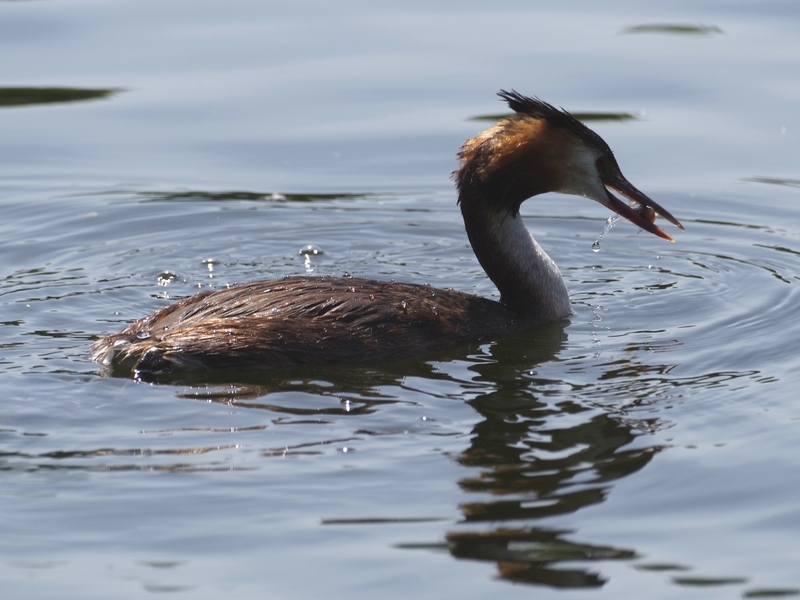 I find listening to the sound of water helps my concentration too.